“Open eyes! Open eyes!” my boy groggily yelled as he was waking up from the anesthesia required for the tonsillectomy. It’s like he knew what he was supposed to do, but he didn’t have the control or wherewithal to do it. He eventually woke up and started behaving like a quieter version of himself. We forced him to sip on apple juice and then he asked if he could watch TV. And then he asked if we could go home, where he had two gifts of things to do while sitting awaiting him. Although there was an unexpected surprise just after Ben was called from the waiting area to get ready for the tonsillectomy: He was the model for a new wagon the surgery department has to take kids back for procedures. I signed a release and the hospital marketing lady snapped pictures as the nurse wheeled him down the hallway. Of course, that was just the photo shoot. His actual surgery came later – and went well. My boy had his tonsils and adenoids removed. The ENT also removed the ear tubes that were on their way out while he was in there. 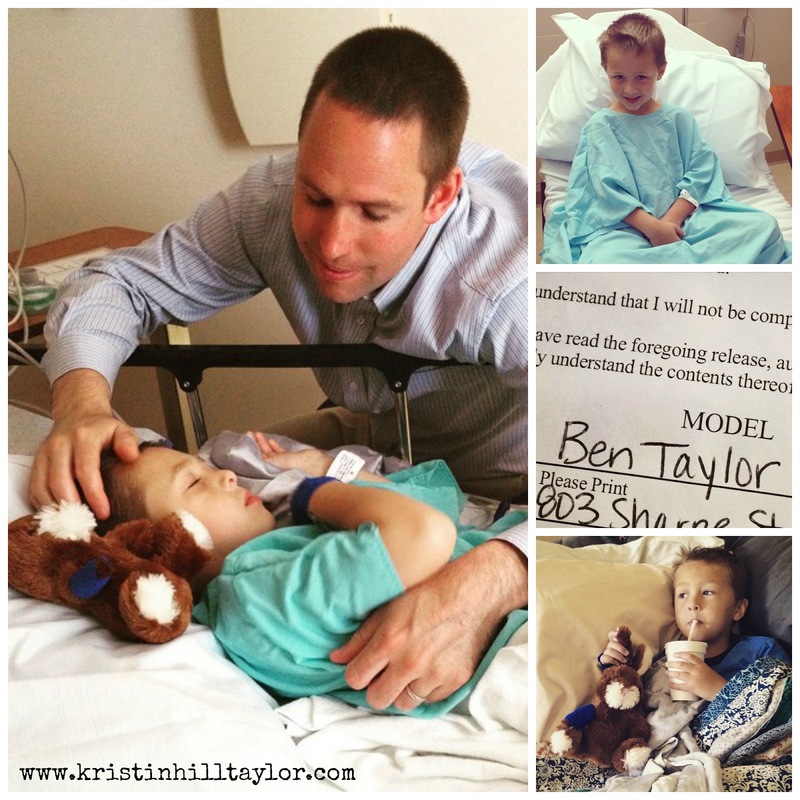 I’m hoping this is the last procedure for Ben for a while. In January 2014, he was diagnosed as being allergic to trees, grass, weeds, and dust mites. He started allergy shots for that later that same month. Related, he got ear tubes in February 2014. All of that has helped him tremendously. But since April 2014, he’s had strep throat seven times – and of those five times since Christmas, specifically. He’s had a history of strep other years too, but not has frequently as the past year. So the tonsils needed to go and ENT recommended taking the adenoids while he was in there. I’ve been on board with this plan since before we even went to an appointment with the ENT earlier this month. My biggest concern is keeping him from running or climbing or jumping for at least a couple weeks. Today he doesn’t feel great – his throat is sore and he doesn’t want to use his voice much. But he’s not complaining. He’s resting on the couch, watching movies, eating Popsicles, and obliging me with my many requests that he take a sip of apple juice. And you know I’m sympathetic because I made animal-shaped Jell-o Jigglers with a mold I’ve almost tossed so many times. I had to read the instructions because I couldn’t remember how to make Jell-o, much less Jigglers. But I imagine he’ll want to run around sooner than the doctor wants him to – which, really, is to be expected while mothering a boy. Thanks for being here and praying, Linda! Thank you for your prayers and sweet comment! Grateful for you and your encouragement. I'm so glad all is healing well for your beautiful boy, Kristin. I can see why they wanted him to model :). You are taking such great care of him, jello jigglers and all. I know how exhausting it can be, emotionally and physically. Many prayers for you both! Thank you for prayers and understanding, Candace! We're both a little tired today after a restless night, but so grateful for the slow day.